What does it Mean for HR Processes to be both Intelligent AND Connected? 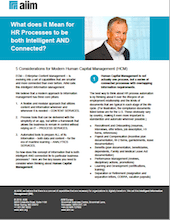 What's the intelligent approach to your HR processes? It stems from an evolving set of capabilities that transform the way we manage information into something smarter and more connected than ever before. AIIM calls this Intelligent Information Management - and we believe it has the power to revamp your business processes, including Human Capital Management (HCM). A flexible and modular approach that utilizes content and information wherever and whenever it is needed – CONTENT SERVICES. Process tools that can be delivered with the simplicity of an app, but within a framework that allows the business to remain in control without relying on IT – PROCESS SERVICES. Automated tools to prepare ALL of its information – both data and content – for the era of machine learning – ANALYTICS SERVICES. Download this FREE tip sheet to learn how this concept of information that is both intelligent AND connected can revolutionize your Human Resources processes.